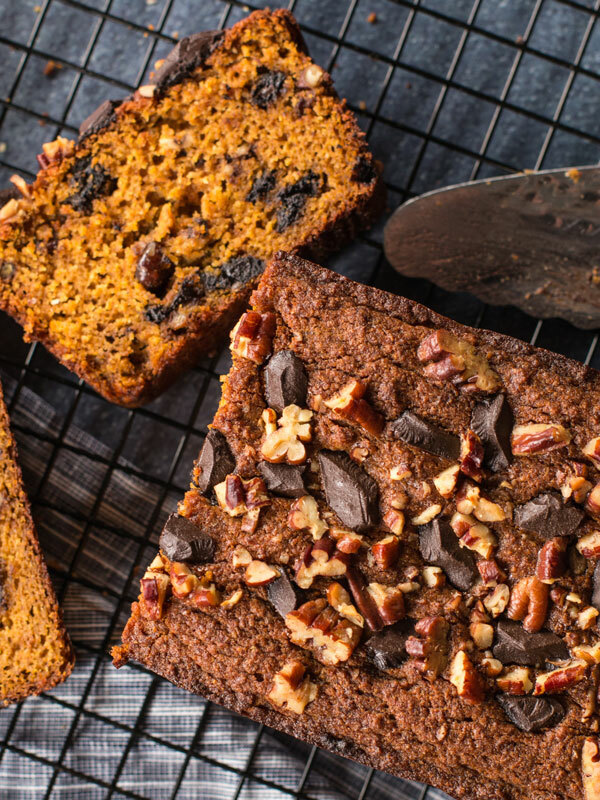 This gluten free pumpkin bread is loaded with chocolate chips and pecans and is moist and soft on the inside. It's also dairy free thanks to coconut oil. 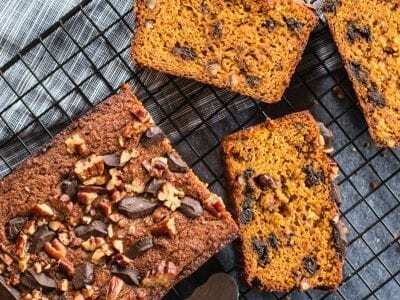 This pumpkin bread is everything you’d hope it would be plus more. It has a crusty exterior and a soft decadent moist interior. 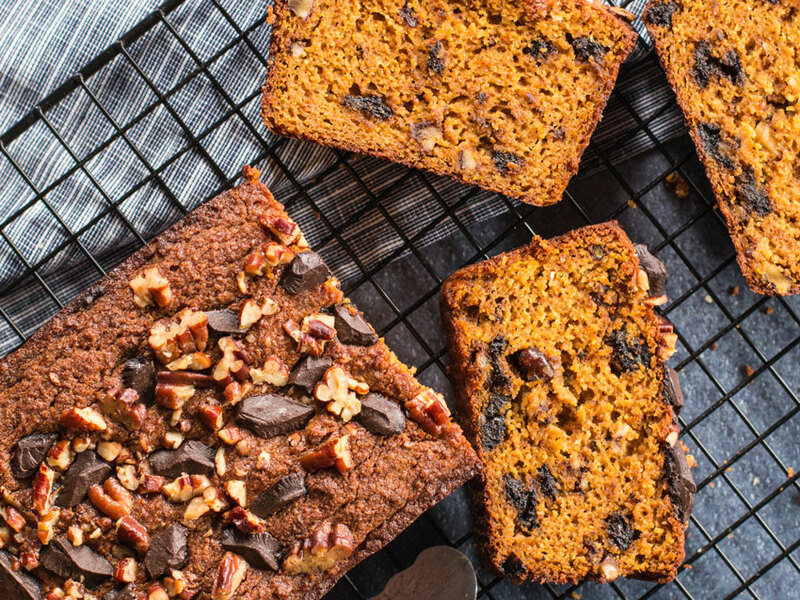 The flavors of cinnamon, nutmeg, cloves, and ginger feel like a warm hug on a crisp fall morning and the orange zest sneaks up on you for an unexpected kiss of freshness. It’s loaded with pecans and chocolate chips for delicious crunch and sweetness. 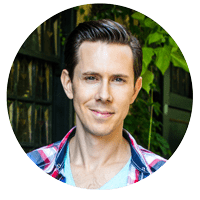 I’m just drooling writing this blog! 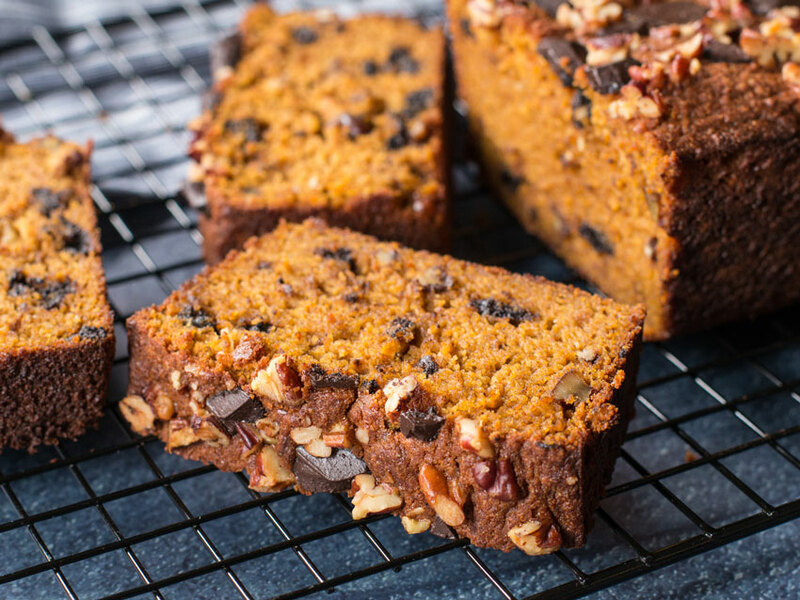 This gluten free pumpkin bread, which is also dairy free (I’m using coconut oil), will be my go-to dessert to make for my family or bring to a party this entire season. 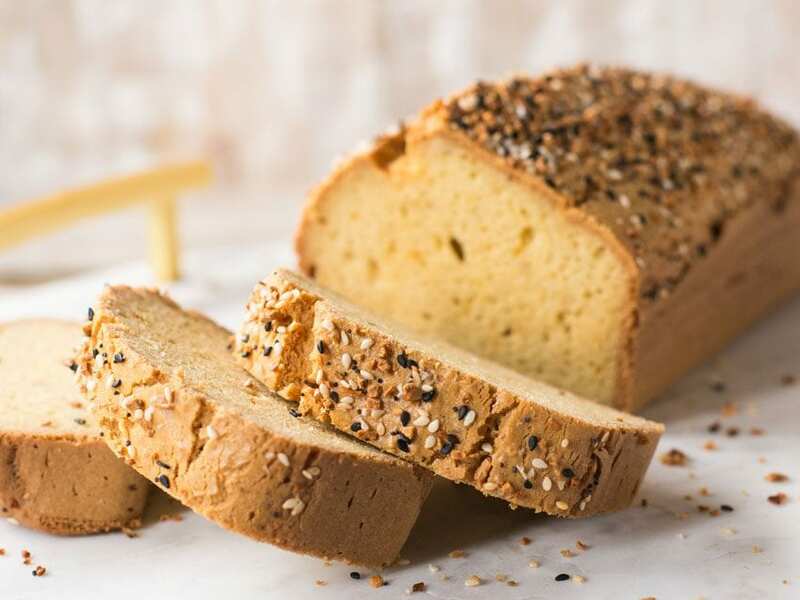 Gluten free flours can be very starch-heavy, so I prefer to stick to more low carb flours like almond and coconut flour. However, to achieve that nice soft luscious texture, you do need a bit of starch. That’s why I’m only using half a cup of millet flour. Millet is also a rich source of magnesium, phosphorus, and manganese. 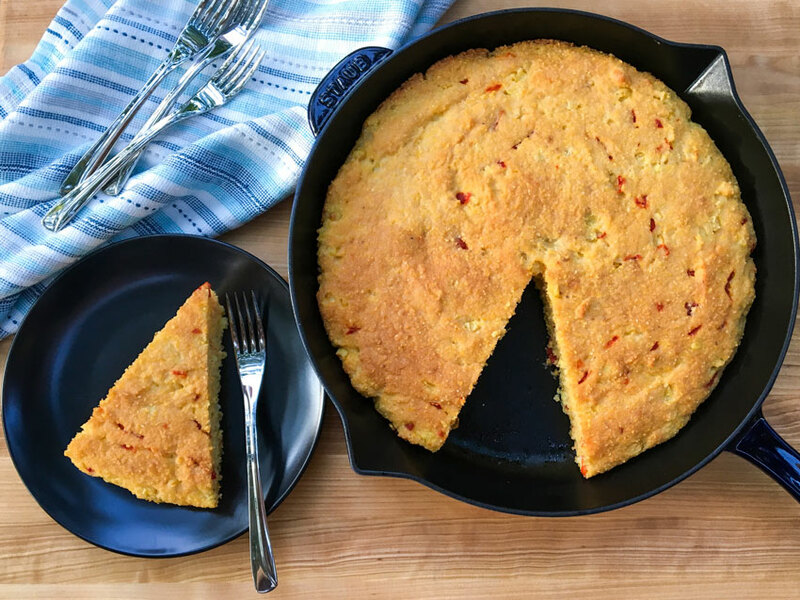 If you don’t have millet, you can substitute it with white or brown rice flour. 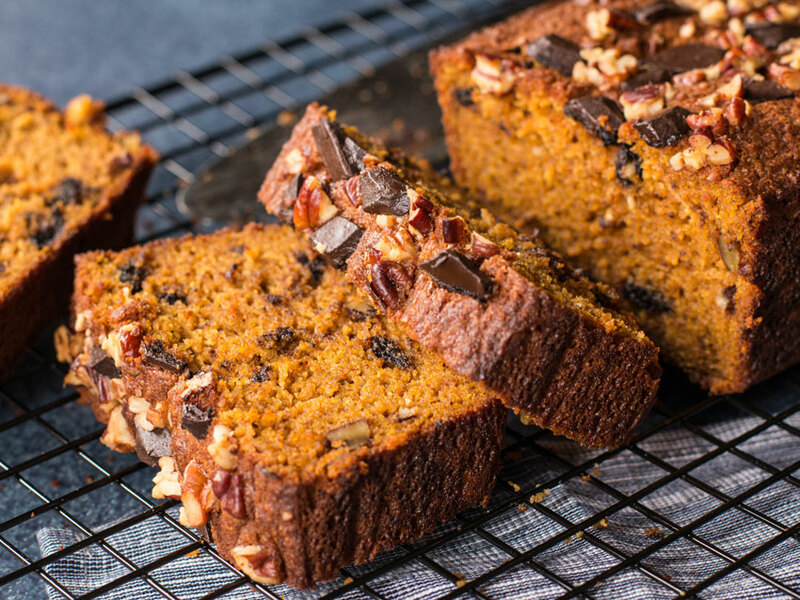 Traditionally, pumpkin bread is made with brown sugar and/or maple syrup, both of which have a high glycemic index (white sugar 65, maple syrup 54 ). 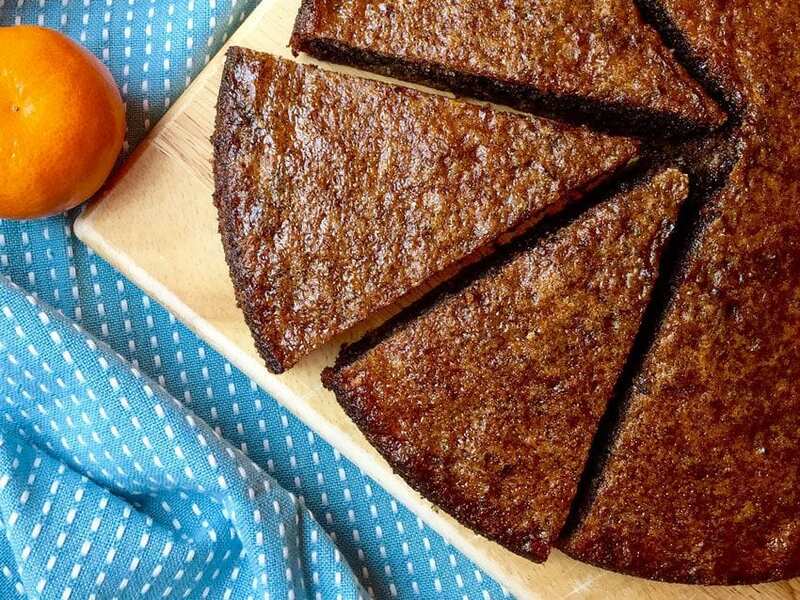 However, I prefer coconut sugar, which is made from the sap of flower buds from the coconut palm tree, for two reasons: 1) it has a lower glycemic index (35) and 2) it tastes just like brown sugar and has very delicious caramel-like flavor. On the other hand, brown sugar is a combination of white sugar and molasses, which makes it even more unhealthy. Pumpkin spice or pumpkin pie spice is a mix of ground cinnamon, nutmeg, ginger, cloves, and sometimes allspice. If you don’t have it you can make your own from the listed spices. When I first tested the recipe, I made my own blend of 1 and 1/2 teaspoons of cinnamon, 1/4 teaspoons of cloves, and 1/4 teaspoons of nutmeg, and it worked out great. If you have ginger and allspice, you can add 1/4 of each to complete the blend. How to make pumpkin puree? For this recipe you can use canned puree, but it’s the pumpkin season so why not make it yourself?! It will be so much tastier! Just cut a pumpkin in half, take out the seeds (you can save them and roast them later in 300 degree F degree oven) and bake the halved pumpkin facing up on a sheet tray at 475 degrees F for an hour. To test if the pumpkin is cooked through, just pierce it with a knife and if it goes in and out with relative ease it’s done. If it feels hard, cook it a bit longer. Once the pumpkin cools down, scoop out the flesh and put it in a food processor and blend it until smooth. You can also use a Vitamix or an immersion blender. You can then store the puree in the fridge for up to a week. 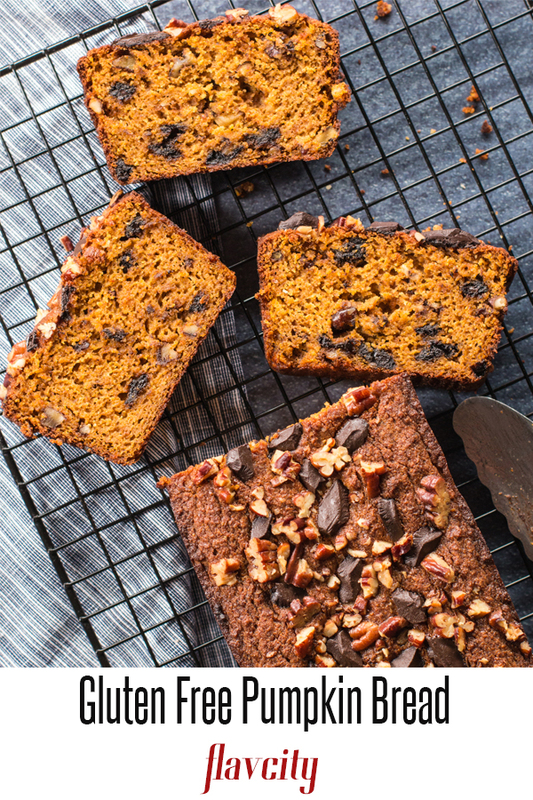 This gluten free pumpkin bread is loaded with chocolate chips and pecans. Use a whisk to mix very well the almond flour, millet flour, spices, orange zest, baking powder and baking soda and set aside. Using a hand mixer beat the eggs with the coconut sugar on high until very fluffy (3-5min). To that add the pumpkin puree, coconut oil, and orange juice, and beat on low for 10 seconds until well combined. Pour the wet mixture onto the dry mixture and use a whisk to thoroughly combine all ingredients. Add the pecans and chocolate chips and pour into a loaf pan lined with parchment paper. Sprinkle the desired amount of chocolate chips and pecans on top. Bake in the oven for 50-60 minutes. The top should look dark brown and when you insert a toothpick it should come out clean. Looks fantastic, is there anything I can substitute for the coconut sugar to make it sugar free? thanks Hannah! you can use swerve sugar as a 1:1 replacement! Oh, es sieht so genial als, schade das es nicht vegan ist aber ich möchte es für Freunde nach backen, sind das US Cups!? Hi Jesse-Gabriel, yes these are US cups. To make it vegan, try using flax eggs (1 flax egg = 1 tablespoon of flax meal + 3 tablespoons of water). Let me know how it goes! 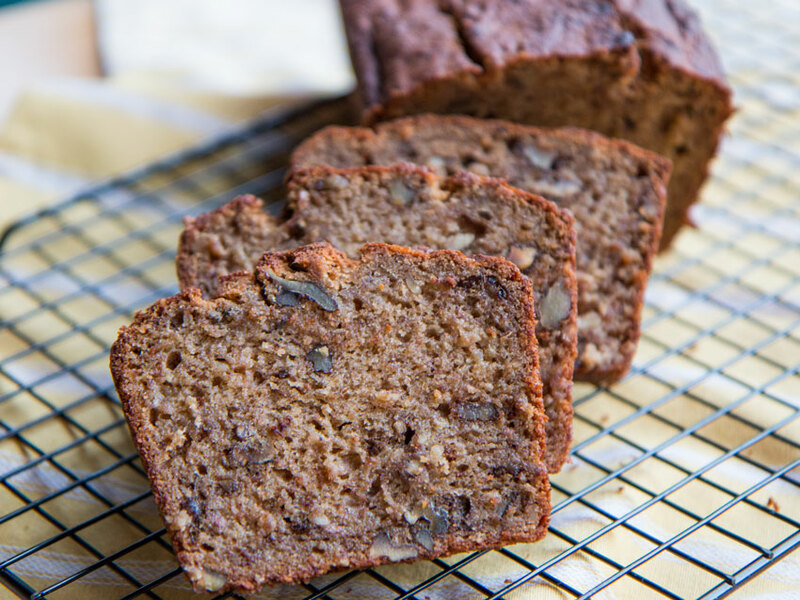 Can I use flax meal in place of the millet flour or would coconut flour be better? defo not coconut flour, the ratios would need to be changed bc its so dry(maybe half the amount of coco flour)! Flax may work, but i am not quite sure. I tried your pumpkin bread recipe for the second time. Something is tasting bitter. Could be the almond flour? I bought it from costco. What else could give the bitter taste? First time I thought it was the baking powder so i got a new one. But still the same. I didn’t use chocolate chips or orange juice. Added apple sauce. Not sure if those cover the taste. I would suggest checking your spices but, when zesting the orange are you only getting the orange part of the zest? You don’t want any of the white pith as it is very bitter.